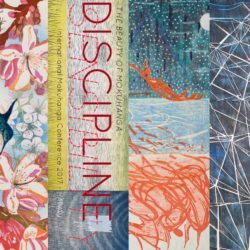 Karen Kunc explores inventive color abstractions of the natural and human fashioned world in her prints and artist books, creating ideas of “strange beauty.” Kunc is a Cather Professor of Art at the University of Nebraska Lincoln where she has taught since 1983. Awards include Fulbright Scholar Awards to Finland and Bangladesh, two National Endowment for the Arts Fellowships and a Nebraska Arts Council Fellowship. Her works have been shown in exhibitions nationally and internationally and are held in numerous private, public and university collections. She has taught workshops around the world, in Egypt, Italy, Finland, Bangladesh, Poland, Japan, France, Mexico, Iceland; and she has lectured as a visiting artist to over 200 institutions across the US. Karen Kunc will address her lifelong influences of Ukiyo-e prints and adaptations of mokuhanga techniques in her woodcut prints. The mokuhanga printmakers were masters of spatial tension, and similarly, the inherent flatness, combined with gradations, patterns and hard outlines,creates images on paper that set an intimate stage containing striking graphic characters, as fragments of action adventure. The contrast of sensation/sensational, graphic effects/graphic power and cultural message/pop culture imagination are facets of storytelling in Ukiyo-e, manga, and western graphic series.